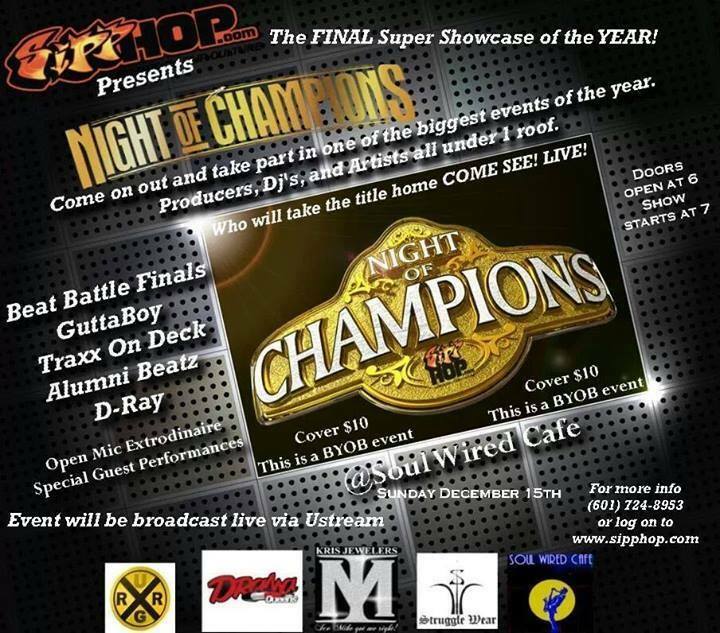 Mississippi’s premier producers has been working all year long to get to this point, Sipp Hop’s Night of Champions. It’s all going down this Sunday Dec. 15th, 2013 at Soul Wired Cafe in Jackson. Where the best producers from the Magnolia state will battle it out beat by beat until only one stands victorious. That producer will have the right to call themselves the hottest producer in the ‘Sip. AS if that just wasn’t enough, there will also be an open mic competition and a producer live production showcase. Music kept flowing by DJ Ron and the event will be hosted by Theca Jones. Cover is $10 and the event is BYOB, which means you get to drink for CHEAP!!!! Kitchen will be open, you can get your burger & chili-fries on or your fish-plate on if that’s more your thing.